My son and I have been having such a fun time together this summer. Its very hard to believe that we will both be going back to school next week! With our summer break days coming to an end I wanted to be sure that we made the most of what we have left. Jonah loves to cook with me and today I had a treat for him up my sleeve… Homemade Kool-Aid Playdough. 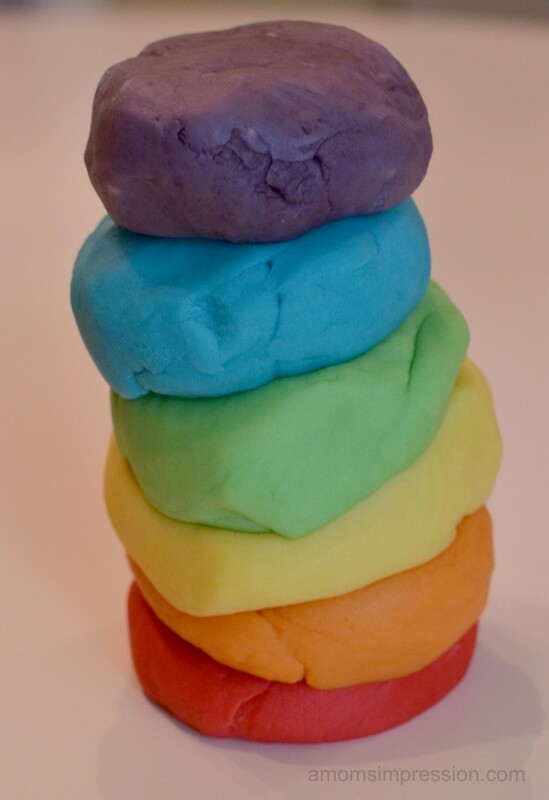 Making play dough is really very easy. I have made it several different ways, but this is my favorite. The dough comes out smelling fruity and delicious and the color is so vibrant. 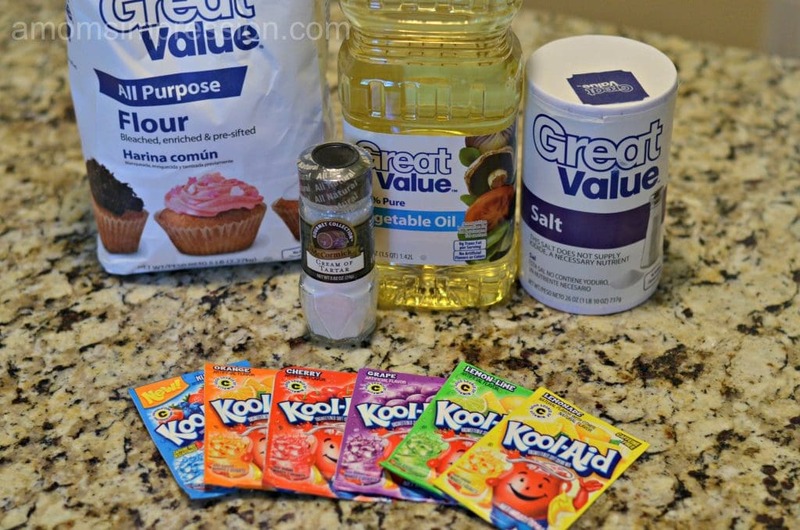 It is a matter of using 6 ingredients (including water) and about 7 minutes per batch. My son and I went to Walmart to pick up some Kool-Aid packets for our summer creation. He picked out several different flavors that were perfect for our project. The colors came out very similar to the packaging that they came in. You can see in the picture below the final color. *Please note that I added a few drops of yellow food coloring to the Lemonade flavor to achieve the yellow in the picture. The original color was more of an off-white and I wanted a true yellow. It still smells wonderful! 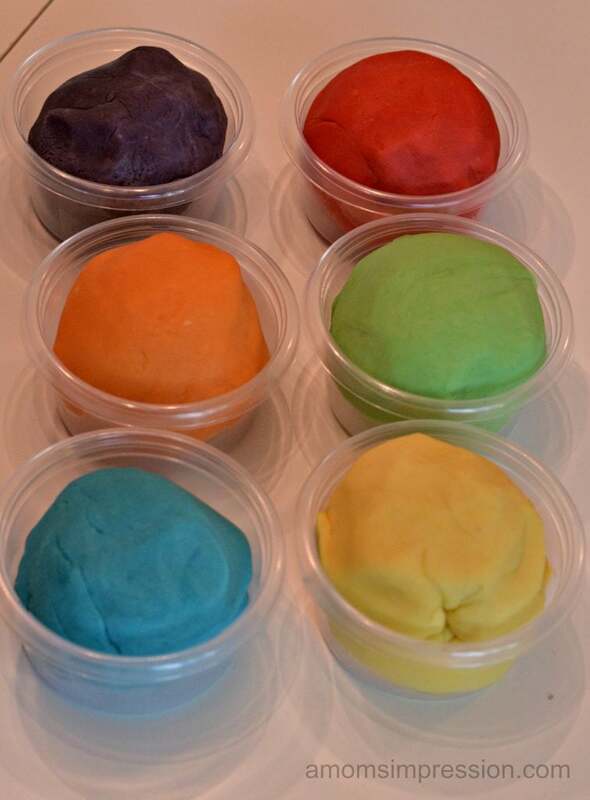 In order to keep your play dough moist and useable, store it in a sealed container such as these plastic bowls or a zipped lunch baggie. They will last a while if you take care of them. 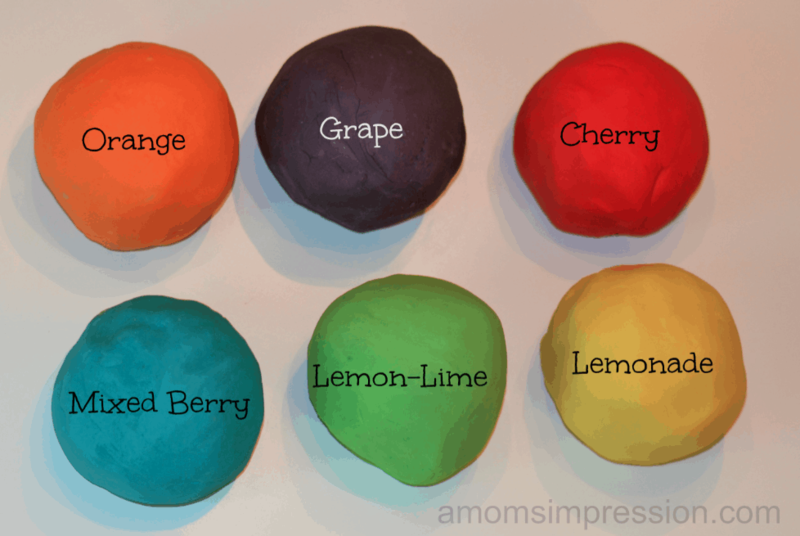 Delicious smelling play dough created with Kool-Aid fruit drink packets. In a medium saucepan pour in all ingredients. Heat mixture on medium and stir ingredients until it comes together to form a ball. Remove ball and when it is cooled enough, kneed mixture until color is uniform. Store in airtight container or baggie. 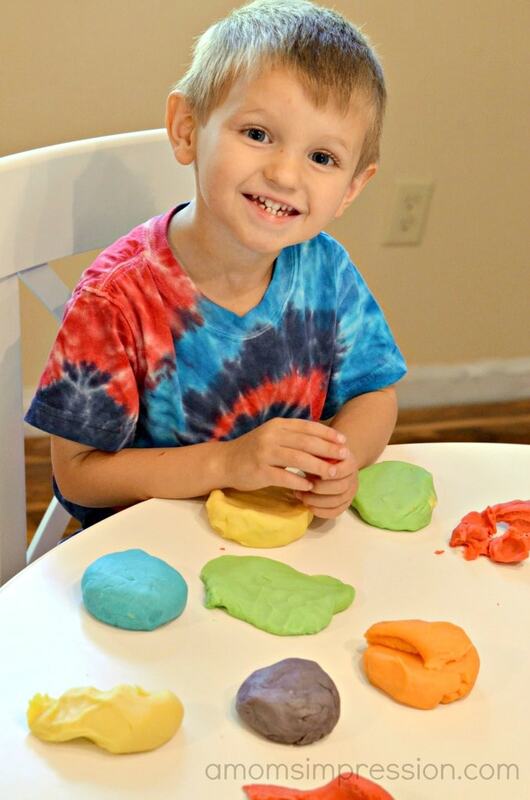 Jonah had so much fun creating with his homemade play dough. It took about an hour from start to finish to make these 6 colors. How are you spending the last few weeks of summer with your family? « What Makes a Really Great Staycation? I love using Kool-Aid for projects. It has so many uses. My daughter’s bestie uses it to dye her hair silly colors! This looks like a great idea! Does the Kool Aid come off on anything or stain? No, I was a little worried about that too, but it doesn’t stain. The colors were really bright. That’s great. 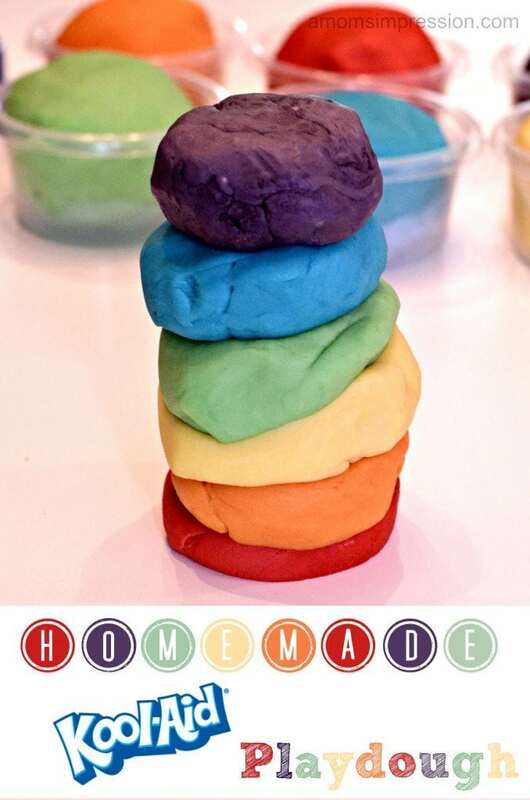 My kids have been into play-doh lately. I bet they’d like to make it first and then play with it! Those colors are fantastic! How long will it keep? I still have mine, so far it has been 6+ weeks! I am going to be making this for birthday party favors. Could you tell me about how much each batch would make? I am thinking about putting two tennis ball size balls of dough in each favor bag. Thanks.